100% Performance Tuned to meet one angler’s specifications…KVD himself. Ready to fish at a consistently high level, with advanced lightweight construction and smooth, powerful performance all around. Features include a one-piece aluminum frame with quick-release sidecover, tough multi-coated finish, MaxCast skeletal spool, ti-coated line guide, polymer-stainless hybrid PT bearings, externally adjustable centrifugal braking, and advanced ceramic drag; lube port. "This reel is so light and very smooth. I will not but any other reel but this one." 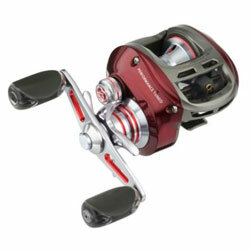 "I love this reel, it's easy to set-up as are all Quantum reels and the quality is excellent!! I also like that it was available in a lower gear ratio for cranking which is what I was looking for!!" "While I haven't had any problems with the reel so far, I haven't had it that long either. It seems like a good reel, but I will say that the thumbar is positioned a little lower than I'm used to."